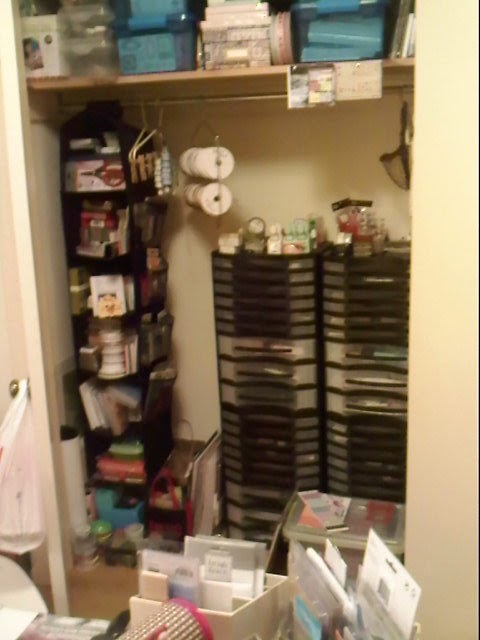 My Craft Room is my sanctuary... Always has been.. From the early days when it was just the spare bedroom where I stored my craft supplies and created at a small wooden dining room table to now, with my table that fits 2 people facing each other, my closet as a "hidden" space for supplies and all of my favorite things surrounding me for inspiration.. 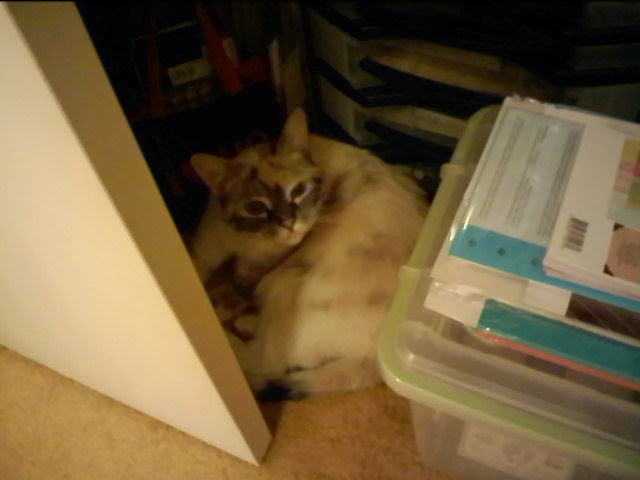 I am sure you will all agree that having your own space is wonderful. I can still remember the days when I used the kitchen table and moved everything back and forth.. Some nights we did eat dinner surrounded by paper, ribbon, my Cuttlebug and other crafty necessities !! Now I have an antique white trestle table from Target - shown here in black http://www.target.com/p/madison-large-trestle-desk-antique-black/-/A-526614 - where I can be creative. It has shelves on each side and on top I placed a piece of Plexiglass (for wear and tear) and also my most-used supplies. I love my space. 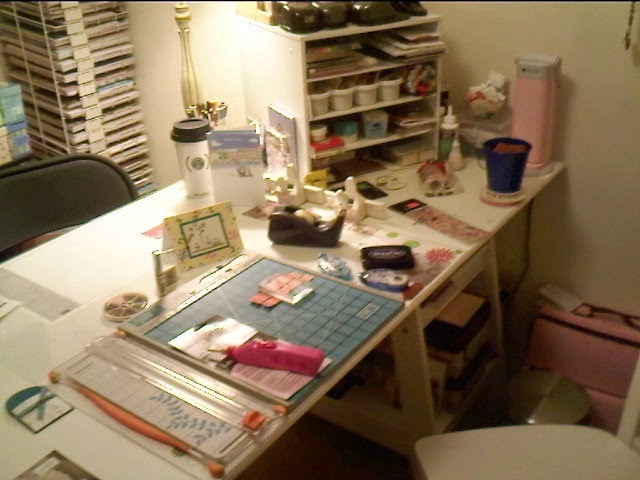 After a crazy day at work, sitting for a few minutes in my Craft Room brings me peace.. A dear friend announced that it was "serene, zen-like" when she came over for tea one day several years ago. 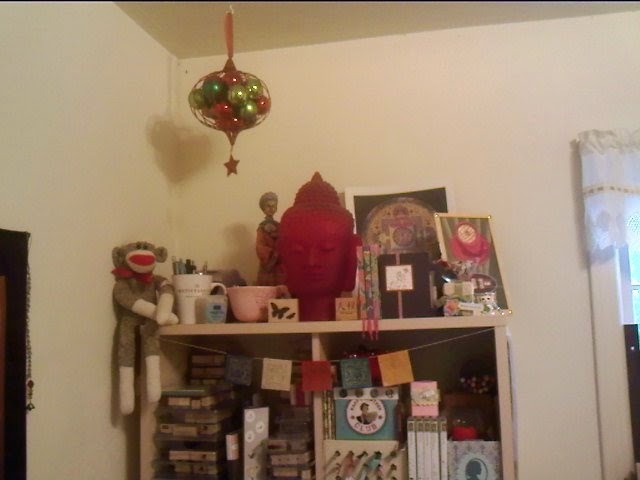 My Meticulosity mug is in there, along with Christmas ornaments, my red Buddha head, my dreaded sock monkey and several much loved clearance finds. 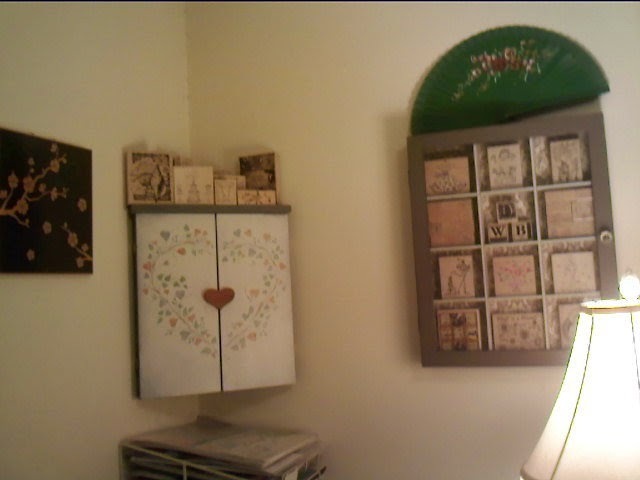 Here are a few pics of my creative space.. I hope you enjoy the view !! What a fabulous crafting area and wonderful collection of crafting supplies. Thanks for sharing. Thank you !! You should see where my "overflow" supplies are.. I really do need to consolidate ( and quit buying more ) !! You have a paper rack?? So. Jealous. Bought that one at AC Moore and also have 2 more that I bought when AC Moore was re-doing their scrapbook section and sold the fixtures they had... Got those for $5 a piece !! Thanks so much !! I love it too !! So jelly of your creative space! I have one corner and wall in my living room--ugh! Love the paper rack--very cool! 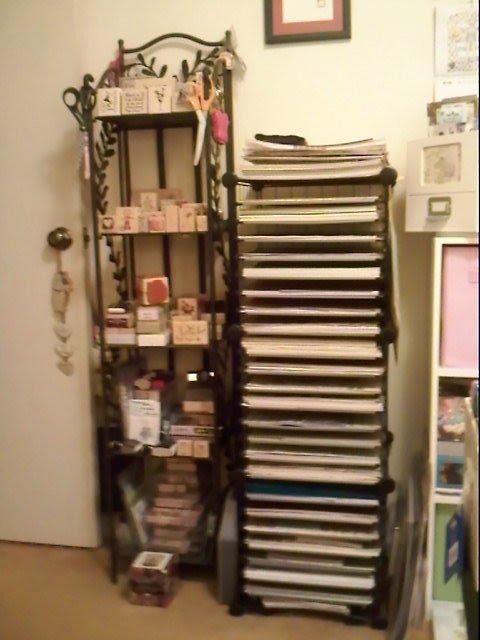 I will have to post a pic of my other paper racks, Bought at AC Moore for $5 each when they were re-doing their scrapbook area.... Actually, I bought 3, 2 were for 12 x 12 paper and 1 was for 8.5 x 11...... One of the 12 x 12 is in my Craft Room,the other 2 are in my office... Yes,I am a paper hoarder!! Totally jealous. My space is much smaller. I love your space....especially having a facing desk for someone else to come craft with you. I love your sock monkey. I want one so bad. Your paper sorter? I WANT it. I see a familiar pink Ott Light. I got carried away with buying them from the Black Friday sale at Joann's. LOL. Such a great price. I have two pinks and one white. Can't have enough light? LOL. I only use one for now. Your kitty is so pretty. Love her. I need to get back to cleaning my space. Once upon a time it was so pretty and clean.